A car avoids a pothole on Lincoln Drive near Gypsy Lane in Philadelphia, PA on January 14, 2018. I was going to take you on a firsthand tour of the biggest pothole ever seen. Then I realized I can't, because I haven't hit it yet. It's out there waiting for me. Or maybe for you. So while I check my bank account balance and tire store prices in less-than-eager anticipation, let's look closely at potholes in a new way. No. Not that closely, you'll wind up under a speeding SUV, flatter than your tire. First, I don't accept that the road to hell is paved with good intentions. Hell's entrance ramp is, in fact, a pothole. This whole pothole thing is a lot deeper than you might think. And the fact that my head slammed into the steering wheel last time I hit one has nothing to do with my theory that, on almost every road I drive, the earth is opening beneath me. 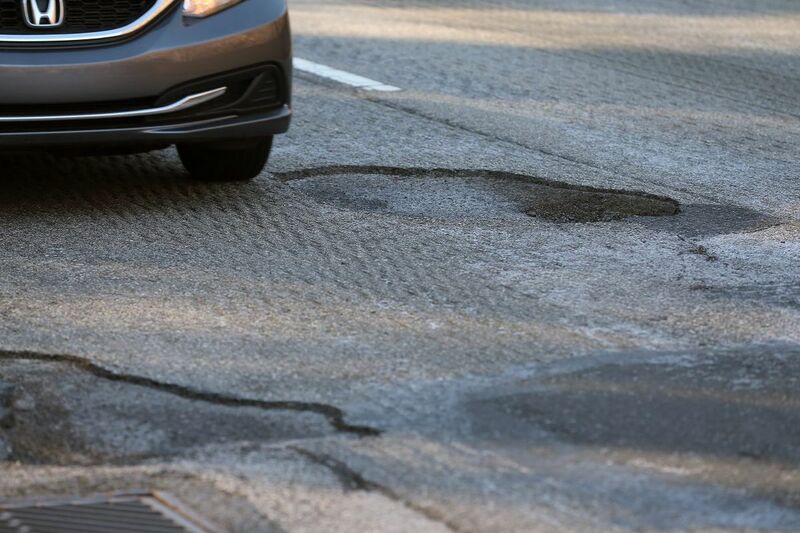 If they can invent driverless vehicles, why can't they find a way to make potholes disappear? I'm envisioning treating asphalt like acne. Oops, there's a pothole, a little dab and it simply heals itself. Hole-istic medicine, perhaps? Oh, and along with driverless cars, can you carmakers create an audio chip, full of screaming expletives, that plays automatically when we bend a rim or blow a tire? "It's the car, honey, Daddy doesn't use those kinds of words." Ah, an end to potholes in our lifetime. Dare to dream. No flats, no endless traffic jams as road-patching crews feed asphalt into the insatiable, gaping mouths that grow wider by the second. The potholes are winning this war. What's the first thing we do after crawling for miles in traffic congealed by workers plugging potholes? We slam our foot onto the accelerator in frustration, so we hit the next pothole, a mile up the road, going even faster. Evidence of a concrete conspiracy, in my view. Remember: Unlike weather forecasts, there's no such thing as Pothole Prognostication. There's no European model to give you the odds of hitting one on your travel route. I feel my credit card trembling in my wallet, as I recall my first "Pothole Ambush." A perfect ride, green lights, blues skies, then suddenly, "Bang!" the tire blows, the rim twists into a Philly pretzel shape, and you wonder why you didn't put those emergency road flares into your trunk, as you pull over, giving new meaning to the word "cold shoulder." Still worse, the "White Knuckle Surprise." You actually see the pothole coming, one nanosecond before you hit it. There's nothing you can do. Like a scene from a B-list horror movie, time slows, your mouth opens, but your screams are silenced by the sound of your tire exploding and disintegrating, your hubcap the only part still racing ahead as it rolls out of sight. I fear, my friends, that potholes will be with us forever. The Bible, long before we had AAA on speed dial, seemed to predict as much. Of course, the prophets called them plagues of locusts, but I think they suspected potholes were the next big thing. I've hit several easily deep enough to be stocked with trout by the Fish Commission. And, like lakes, they might soon have names like "Hissing Air," "Axle Bend," and "Quivering Rim." Soon, I'm sure, the biggest will begin appearing on our traffic apps: "Caution, canyon ahead…" Call it Pothole Paranoia, but I envision the worst of these future quarries becoming tourist attractions, signs reading, "Visit the Great Highway Caves, see ancient hubcaps, whole cars that vanished." Is the Bermuda Triangle nothing more than a vast, unmarked cosmic pothole? Did the inspiration for the classic sci-fi flick Journey to the Center of the Earth spring from, or into, a pothole? And finally, is it mere coincidence that the 1981 John Travolta movie Blow Out was filmed on Philadelphia streets? Trust me: This time of year, the only ones who view inflation as an economic virtue are tire store owners. But as we brave this lunar landscape, once known as our neighborhood streets, a final word of consolation: My research reveals that, unlike much in life, there's nothing we can do to avoid potholes. Like head colds and mosquito bites, they are inevitable. And if you are wondering where I unearthed this pebble of roadside wisdom I'm sharing with you? You will, eventually, wind up in a hole.